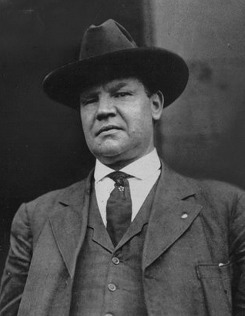 Bill Haywood started working in the mines with other children when he was nine years old. In his mid-twenties, he was a miner in Silver City, Idaho, where he helped unionize his co-workers into the Western Federation of Miners (now the United Steelworkers of America). Within a few years he was working at the WFM's national office, and he quickly became the union's public face in battles against child labor and for a decent living wage. He was a long-time member of the American Socialist Party, and famously said, "If one man has a dollar he didn't work for, some other man worked for a dollar he didn't get". He was a co-founder of the Industrial Workers of the World (IWW), and an outspoken proponent of the Wobblies' goal of unionizing all workers in "one big union" -- laborers in solidarity with craftsmen, blacks alongside whites, and woman as well as men. Strikes in those days were not polite affairs: Company owners routinely hired thugs to violently encourage picketers to return to work, strikebreakers faced likely beatings at the hands of workers, police and Pinkerton's agents were often weapons of management, and it was not rare for strikers or policemen to be killed. In 1905, Frank R. Steunenberg, a former Governor of Idaho and a fervent opponent of union activity, was murdered, and over a thousand union leaders were rounded up and held without evidence while the killing was investigated. Eventually Haywood was charged, along with union President Charles Moyer and George Pettibone, a union member who had served as Moyer's bodyguard. With Clarence Darrow as his defense attorney and nationwide attention in the media, Haywood was acquitted after it became clear that the key witness against him had committed perjury. Moyer and Pettibone were acquitted in subsequent trials. As the IWW gained strength, Haywood grew into a folk hero for working people (widely known as "Big Bill") and a demon to employers. In 1917, as America entered World War I, Haywood and other IWW leaders were arrested and charged with sedition, for speeches describing the war as "a capitalist attack on the working class". For his words, Haywood was convicted and sentenced to twenty years in prison, but he announced that he would appeal the verdict, and fled to the Soviet Union while free on bail. He lived the remainder of his life in Communist Russia, where he married a Russian woman. Upon his death in 1928, Time described his exile as "almost without honor". The Nation said in its obituary that he was "as American as Bret Harte or Mark Twain".